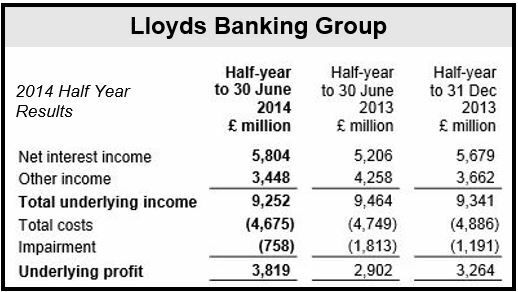 Lloyds Banking Group H1 profit plunged by over 50% to £574 million ($970.8 million) compared to £1.56 billion in H1 2013. The partly-government owned British bank was hit by several legacy charges, including £600 million set aside for mis-selling PPI (Payment Protection Insurance) and a £226 million to settle a Libor rate-rigging probe. The total amount of money set aside now stands at £10.43 billion. UK and US financial media say the bank has suspended at least two traders after settling with the Bank of England and regulators for rigging benchmarks. Bloomberg quotes an unnamed person claiming to have knowledge of the matter who said Lloyds suspended Clive Jones and derivatives trader John Argent in London. Total income fell from £22.07 billion in H1 2013 to £14.4 billion in H1 2014. Underlying profit, however, which strips out provisions and one-off costs, increased by 32% to £3.82 billion; a better result than investors had been expecting. Lloyds says it expects pretax profit for the full year to be considerably ahead of H1 as the British economy continues growing. It added that H1 2013 figures were inflated by several one-offs, including the sale of UK government bonds. The UK’s largest retail bank says it intends to restart shareholder dividend payments. It will apply to the Prudential Regulatory Authority, the United Kingdom’s financial services regulatory body, in the second half of this year to restart “modest” dividend payments. Investors will be watching Lloyd’s dividend policy closely. Before the government sells off more of its stake, the bank will have to clarify how much it plans to pay in dividends. The bank was bailed out by the UK taxpayer to the tune of £17 billion during the financial crisis, hence its part-government ownership. The UK government has sold over £7 billions’ worth of Lloyds shares during the last twelve months, reducing its stake from approximately 40% to 25%. It says it will sell an additional 15% to 20% holding to institutional and retail investors later in 2014. Institutional investors are companies that trade using other people’s and organizations’ money, while retail investors use their own funds. Reuters UK quotes Chirantan Barua, a Sanford Bernstein analyst, who believes about 70% of earnings should soon be returned to shareholders each year. “We feel the second half will be strong for the bank – especially post the imminent disposal of the government’s remaining equity in the bank; a factor which has remained an overhang in recent times,” said Barua. Lloyds’ core Tier 1 capital ratio increased to 11.1% at the end of June 2014, compared to 9.6% twelve months earlier. By law, European banks must have a ratio minimum of 4% under the Basel III regulatory program; larger banks need a higher ratio, which is set by local regulators.